Article 1:Nara- 18 and Backpacking Europe- First Impression! Article 3:Tanya Estudiando en el Extranjero Otra vez! Nara – 18 and Backpacking Europe – First Impression! First thing I heard over and over again was ‘you shouldn’t do that alone, that’s dangerous!’ I was frustrated with people around me in my life telling me that I couldn’t travel alone. So it made me want to do it even more. Bought my plane ticket, Euro-rail pass and booked a few hostels to get me started. Everything came into place, starting on my high-school graduating day, June 21, 2004. After receiving my diploma I rushed home, grabbed my backpack and everything that I needed to begin my Europe Trip. It wasn’t until I landed in Paris, July 12, 2004, where the fun began. I took the Channel Tunnel to get from London to Paris, which only took about 2 hours in total. Yet, this day was only the beginning for me and I was not aware that I was going to add another 2 more hours of metro craziness to carry me through my first day of backpacking. As you maybe aware, the Paris Metro is massive!! !…well compared to Toronto subway, there is no comparison. Just imagine my first impression seeing the map and trying to find my hostel’s location. Oh yes, I was blown away with an astonishment, WOW, and HELP all over. Oh and did I mention French is not my forte; so asking a local was out of the question. It came down to what I usually do; go with my gut feeling. I hopped on the metro and freely went from one line to another until I reached my destination – Rennos, which is on the 12 line (green). Once I reached the main streets, I randomly walked around and within 20 minutes I found the Hostel. I was eager to meet other backpackers and hear their adventures, however there was one small problem when I checked into the hostel. As I was about to go up the stairs to enter my room, a sudden wave of WATER crashed down the stairs and had me flying backwards onto the floor. Oh, yes I was soaked from head to toe, including my backpack. Turned out, a water pipe burst on the second floor and due to it being the main water pipe, there was a lot of press of water that went pouring down the stairs. First experiences are always thrilling. Would you call this first experience, extreme? As you can imagine, it took me a few hours to dry all my clothes and to finally settle in. My first time in Europe, was an unforgettable first experience. It was a hot, sticky morning in Nice, France on July 21,04. I spent the morning alone backtracking my experiences with friends through emails. Prior to this day I met two girls, one from England and the other from New Zealand. I finally met up with them later that afternoon. 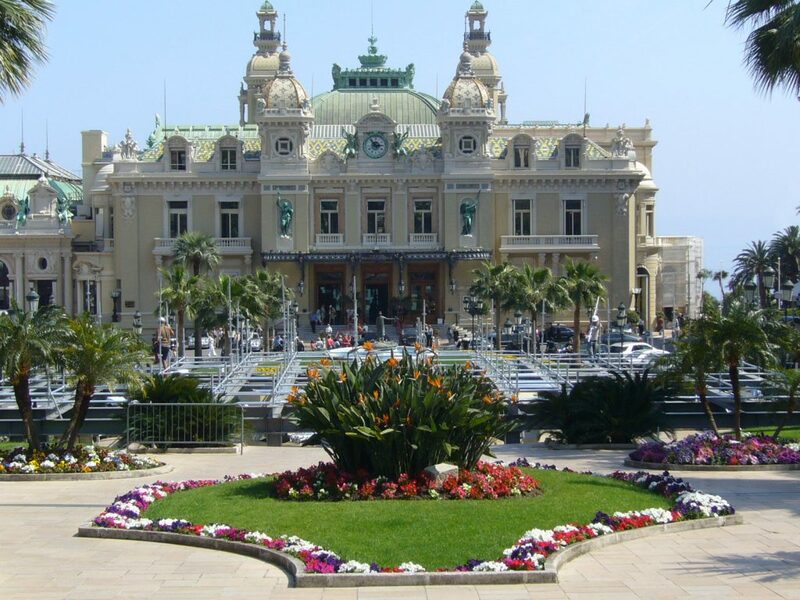 We hoped onto a local train to Monaco to visit the Princes Palace and the Monte Carlo Casino. Most of the day was spent exploring the Palace and talking to people who owned these yachts that carried helicopters, sea-doos, and speedboats. Amazing how these yachts are from countries around the world. Wonder how much these yachts use in gas??? As the afternoon past, the three of us had dinner at a beautiful restaurant that over looked the French Riviera, however the plan for the rest of the evening was to check out the Casino. With every expensive car you can imagine parked outside the Casino and people dressed in gowns and million dollar outfits. There was us, the three backpackers and not looking so hot. But whatever, we went to explore this famous Casino; cause isn’t that what backpacking is all about?? As we entered the Casino on the red carpet with flip-flops, cut-off shorts, and tank tops there was no turning back now. We started to explore the Casino, it was gorgeous and very glamorous. Somehow I decide to play a game of Roulette with the little money I had. As usually I lost, but at that moment some guy took me by the arm and pulled me to the front entrance and mentioned a few words in French, pointed at my shoes, shook his head and marched off. Oh yes it was quite the graceful exit I did as a backpacker. As for my friends, they were asked to leave… not pulled to leave! So I guess I was pulled and kicked out of the Monte Carlo Casino. It was 7 am, July 28, 04 and I was getting on the train to Brindisi, in order to catch the ferry to Greece. I was so tired, but I had 6 hours to rest until I reached my next destination. Once I arrived in Brindisi the first thing was to get the ferry ticket and hope that there was a ferry leaving that day. As you may know, being a backpacker is all about taking risks and as I always say, WING IT! So that is what I did with this little adventure of mine. Finally with some luck, there was a ferry leaving that day. I paid the 54 Euros for the ferry, along with another 9 hours of waiting to get on the “1940”, rusty old vessel. Oh Ya, it was a scary looking ship!!! The 9 hours wait was due to the ship’s crew wanting to smoke their cigars along with finding their captain’s whereabouts. However, I took advantage of the wait with some friendly chatting to a group of Spanish backpackers. We played cards, ate lots of cheese, and listened to some great Italian music all night. It wasn’t until midnight that we all were allowed on the boat and at that time I was exhausted. Oh yes, backpacking is a vacation from reality, but can be exhausting. The next morning I woke up around 9am after a good sleep considering I slept on the floor with bags, clothes, and shoes surrounding me. I headed for the deck of the boat to see the view, plus to get some fresh air. As I got to the deck, a few of the crew workers were running around yelling in Italian and all of a sudden an announcement came on. I couldn’t understand it, but I realized the boat wasn’t moving. I quickly went to find my Spanish friends to see if they knew what was going on. Once I found them, they mentionned that the boat broke down and at the moment the crew is trying to solve the problem. So as it was, we all waited 10 more hours in the middle of the Mediterranean to finally be on our way to Greece. 10 plus another 5 more hours to reach our destination, with no food, little water, and nothing to do, oh it was quite the backpacking adventure! Oh and did I mention that as soon as I got off the boat in Greece the first thing on my mind was shawarma! On the first morning we woke up in Torino, my roommate and I decided to go on our first grocery shopping adventure. The nearest discount grocery store to our apartment was a 15 minute walk away. Growing up as an Italian/Canadian, I didn’t feel out of my element while shopping for food: Fettuccini. Tortellini, Ravioli and Tomato sauce all pretty much look the same whether you are buying it in Canada or Italy! This being said, my first culture shock was when we were waiting in line to pay- the cashier was sitting down while serving the customers. And you know, which is fine if she’s actually being productive by scanning the articles but no! She was soooo slow. She was definitely in NO rush to ensure customer satisfaction by offering a quick customer service. Although it’s not necessarily a bad thing but when you live in a place where things move quickly, it can be pretty annoying to be found in this new, slow environment. As we were paying for our groceries, she asked us how many bags we wanted. We found it strange because it’s somewhat difficult to guess how many bags you will need exactly. And then we realized that she charged us 4 cents per bag because bags are not free in Italy. Remember people… Paying for plastic bags at the grocery store in 2005 was imaginable if you were North American! Adapting to the slow pace life that Italians embrace was difficult at first. Coming from a North American city, I’ve always been surrounded by stress and racing against time. 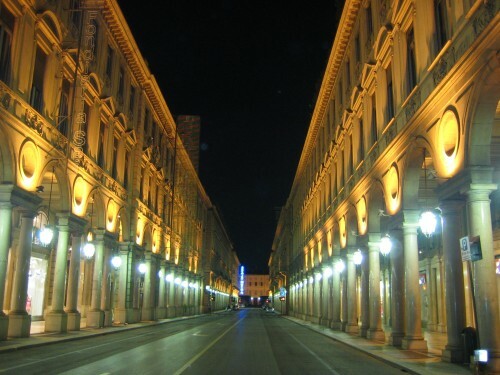 I do have to admit that once I adapted to the Torinese life, I did learn to appreciate the stress-free life they enjoy! Growing up in Montreal, I’ve seen thousands of snow storms. From 5cm to 30cm, let’s just say that I am accustomed to snow. But… I guess not everyone is, especially if you live in Torino. I was walking in the city after a light snow fall (less than 5cm) when I realized I was laughing alone… YES! I was laughing by myself. I saw a bunch of people outside their homes, “shovelling” the snow with a BROOM! It was the funniest thing I had ever seen in Torino so far. It would have made more sense if I were walking in Southern Italy where most people never even saw snow but this was Northern Italy… they are located close to the Alps and they’ve all already seen snow! Why wouldn’t they own a shovel?! As I wake up to the sound of my alarm clock, I realize that I’m late once again! I run to the kitchen to prepare my espresso coffee while attempting to get dressed at the same time. Once my coffee is ready, I open my backdoor, pull a chair and sip my espresso on my balcony as I’m staring at the Alps. After my morning coffee, I walk to the bus stop and wait for the no.17 bus. I normally have two options at this point: Either I wait half an hour until the bus shows up, it ends up being full and then I see another two buses behind it that are empty, or I wait 5-10 minutes and get stuck in a ‘concentration camp’ on the bus. Once I finally get off the bus, speed walk to school and arrive to class late, I realize that all the students are still waiting for the teacher to come back from the bar where he is having his morning espresso and morning conversations with other teachers! I have to admit that at first, I didn’t connect with the city: industrialized, cold and cloudy. It was a new city I had to discover and at first I didn’t really want to: I was missing the Montreal nightlife, my friends and family. Although it wasn’t too cold in Torino during the months of January and February (the minimum it went down to was about -5°C), it didn’t bring out the best of the city. And yes, I was meeting a lot of people through the Exchange Program, they didn’t compare to my friends from home. But as time passed, I shared moments with people, became friends instead of just acquaintances, and the feel of the city shifted from bad to good. We often went for Aperitivo, which is an interesting concept in Italy. It’s a type of fancier version of Happy Hour where you get free food when you buy one drink. There were also many nice lounges and clubs in the city, where I met locals. You enjoy the city a lot more when you start to feel comfortable with yourself and your surroundings. You learn very quickly about the two most important sites on the Internet when you are in Europe: www.ryanair.com and www.easyjet.com. I often surfed on these two sites to schedule my next week-end trip. I began planning week-end trips to places where I couldn’t leave Europe without visiting: Switzerland, skiing in Chamonix (France), Amsterdam (Holland), Prague (Czech) and Northern Italy. Then, by doing online research, I found cheap flights to various places that initially never crossed my mind: Oslo (Norway), Copenhagen (Denmark), Ljubljana (Slovenia), Zagreb (Croatia) and Budapest (Hungary). Getting around is beyond easy. Yes! It’ll be easy even if you’ve never done it! Find a cheap flight to one city and then use the train to travel between one city to another… and voilà, you will be traveling in Europe in no time! Tanya Estudiando en el Extranjero Otra Vez! When I arrived at Monterrey’s General Mariano Escobedo Airport on January 5th, 2006 after 3 flights and an empty stomach, I was told that the airline company lost my luggage… my LIFE! Because I was studying in Mexico for 5 months, I packed practically all my clothes and brought most of my personal belongings. BUT, I didn’t freak out! Why freak out? They are only materialistic things that help represent who I am but don’t define who I am. I was alive, still had my memories in my head and still had the ability to create memories. So, instead of panicking, I walked out of the luggage area, alone, with no luggage, and headed outside. All I had was an address. A million taxi drivers came towards me as I walked out the airport, so I picked one, showed him the address and we drove off. The only problem was that he didn’t know the location of where I was going! Unable to speak decent Spanish, I was using my Italian and French to try to explain to him that I was an Exchange student from Canada who was coming here to study at the Tec de Monterrey and I was trying to get to my host family’s house. Yes… so this is definitely easier said than done when you cannot communicate in the same language! But, everything worked out in the end. I arrived safely to my destination. I chose Mexico as my destination for my second student exchange because I wanted to learn Spanish. I thought I knew what to expect from Mexico prior to arriving there… you know, Mexico is fairly close to Canada, we all know about Cancun, tacos, playa and fiestas… but oh boy was I ever amazed by this country of which I had so few expectations for! Most of us have no idea where Monterrey is located on a map because it’s not Mexico City, Cancun or Puerto Vallarta. That shows how much we DON’T know about Mexico! Monterrey is considered an important business hub in Mexico because of its close location to the U.S border. The city is surrounded by el Cierro de la Silla which creates high temperatures all year round but this is especially true during the summer months. Many people I met would argue how Monterrey is not a real Mexican city because it’s located in the North, it only has a handful of monuments and there is no beach. But then again- what defines a real Mexico? People here speak a different Mexican accent, they use their own expressions (e.g. guey, no mames), listen to Norteña music but they still eat tacos, nopales y arroz! That is Mexican enough for me! Their main dish is the Cabrito (baby goat) and get ready to eat a lot of carne asada (bbq’s).At sunset, most young people will head to the Barrio Antiguo. It’s a small neighborhood in the downtown area that has a handful of clubs (antro) and bars. The area is filled with people walking in the streets, with green taxis and with street vendors selling hot-dogs and hamburgers (with chili of course). Most clubs and bars are free to get into, but there are always those higher end clubs which will cost you about 10$ to enter. 1 liter drinks are very common here and they normally do not cost more than 5$. The music is the greatest part of it all. Most clubs play reggueton and some also have live bands who will play the most popular songs. And who said Monterrey didn’t know how to party! One of the first things I noticed in Mexico was the huge gap between social classes. The malls in Monterrey are nicer than the malls I’ve been to in Montreal. I’ve seen some of the biggest houses in my life hidden within the valleys of the Cierro, near Chipinque, Monterrey’s National Park. But then, I’ve also seen some of the worse concrete box-type houses along the Cierra. This is the land where one product in a supermarket will have a different price depending on what area of the city you are buying it from.Mexicans are one of the nicest people I met. They are very welcoming and always ready to help you! They are a culture engraved with so much history that it is beyond fascinating. I enjoyed visiting museums and pyramids to learn about the Mayans or how the Spanish conquered Mexico. On the other hand, living in Mexico truly made me appreciate my life. I’ve seen poor and beyond poor with my own eyes for over 5 months. By walking in any Mexican city, you can see someone dressed in brand clothing, driving a nice car on their way to a prestigious school while the person right beside them is too poor to attend school and is sitting on the side-walk trying to sell bubble gum for a living. Most villages in Mexico don’t have access to electricity. 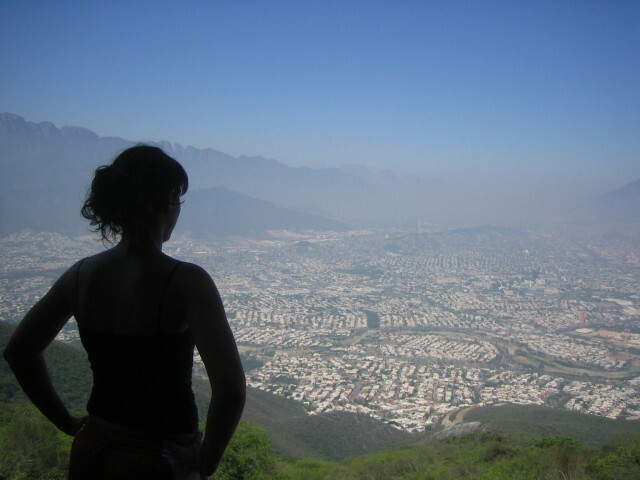 Living in Mexico was the first experience where I became fully appreciative of what I had. And still am today. How to describe this campus? It was huge! It took about 15-20 minutes to walk from one end to another. In all, we were about 400 international exchange students. I met people from all over the world. The international program organized many events, anything from trips, cooking classes, opportunities to meet locals and many conferences. There was an indoor pool and a nice gym, which were both free for students to enjoy. What I appreciated the most about it all was that the English business classes were mixed between International students and locals. 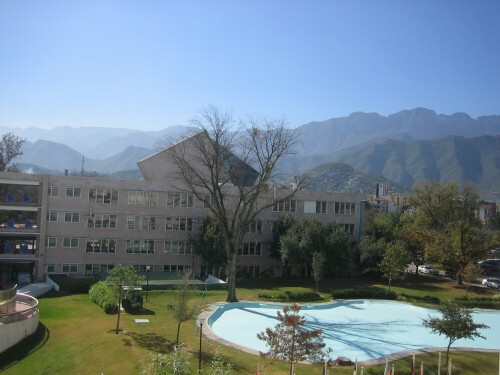 Because the campus in Monterrey is the biggest one in Mexico, it attracts many Mexicans, from all over the country. I had the opportunity to meet not only students from Monterrey, but also many students from different regions in Mexico. My ultimate goal when I decided to study in Mexico was to learn Spanish. After my experience in Italy where I lived with a Canadian roommate, I realized that we never spoke Italian at home because speaking English was easier. And let’s admit that we rather take the easy way out than put in the effort! When I was presented with three choices of where to live in Mexico: apartment, residences or host family, my choice was simple because I knew what I wanted out of this experience. The best way to learn the language when you don’t speak it is to live with a family. My host parents were a little older, more or less in the 60’s. They are considered a middle-class family, a class that is very small in Mexico. They also had a maid from 9am to 3pm. She would clean and cook lunch, which is the most important meal of the day. The family was very warm and friendly. I ate Mexican food everyday. I loved it! I shared my room with another Mexican student, Ximena from Cuernavaca, who studied at a different University. Gladly, we got along great during the entire 5 months. Let’s just say that she was extremely patient with me and my many failed attempts to complete a full sentence in Mexican! Although living in Monterrey was awesome, I was always ready to grab my backpack and leave on weekends or for weeks at a time throughout the semester. There are many low-cost airlines, such as Volaris, Interjet, Aviacsa and Click Mexico. I had the opportunity to visit Chiapas, Quintana Roo, Yucatan, Jalisco, Michoacan, Oaxaca, Mexico D.F and Chihuahua regions. In Michoacan, we went horse-riding for four hours to get to an active volcano, which we then had to climb. Nothing beats the pyramids in Teotihuacán, or the waterfalls in Chiapas. We took a train ride through the biggest canyons in Mexico where the view was out of this world! When it was time to hit the playas, Tulum and Puerto Escondido were gorgeous! As a young female traveler in Mexico, I must emphasize that I have never felt in danger when traveling the country. You obviously need to be low-key and avoid the dangerous parts of the city but overall, I didn’t face any dangerous situation throughout the duration of my stay in Mexico. This is where I took a conscious decision to stop listening to Westerners who claim that backpacking in developing countries is dangerous! I’m fed up of hearing it!